CoirGreen (CG) “Environmentally Friendly” is an organization that manufactures and supplies products for the Erosion Control and Horticultural-Agricultural sectors. We at CoirGreen believe only in providing the best for our partners. Our well trained staff makes sure each and every product goes under strict quality control methodologies which are globally accepted by industrial standards. CG ‘s ultimate goal is to value it’s employees and customers while been an ambassador to help protect our environment. This is our motto, and we stand by it for our customers, employees and our stakeholders. Our employee’s are our greatest assets, and our customers are our life! Been 100% employee owned, CG stands for its guaranteed quality of products and services with a flair for professionalism! Coir Green (CG) “Environmentally Friendly” is an organization that manufactures and supplies products for the Erosion, Horticultural and Agricultural needs of our clients. Coir Green is a family business which only believes in providing the best of products for our partners. Our well trained staff ensures each product goes under strict quality control methodologies. CG ‘s ultimate goal is to value it’s employees and customers while been an ambassador to help protect our environment we live in by using environmentally sustainable products. This is our motto, and we stand by it for our customers, employees and our stakeholders. Our employee’s are our greatest assets, and our customers are our life! Been 100% employee owned, Coir Green stands for its guaranteed quality of products and service with a flair for professionalism. Coconut fiber (Coir Fiber and extracts) usage has become very common among professionals in various industries due to its versatility. In the horticultural industry, agricultural industry, or erosion control industry, coir has established a remarkable reputation for its superiority to other available natural materials. 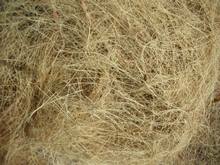 Coir fiber is found between the husk and the outer shell of a coconut. The individual fiber cells are narrow and hollow, with thick walls made of cellulose. They are pale when immature but later become hardened and yellowed as a layer of lignin is deposited on their walls. The high lignin content (46% by weight) of coco fibers makes it naturally resistant to mold and rot and requires no chemical treatment. There are two varieties of coir. Brown coir is harvested from fully ripened coconuts. It is thick, strong and has high abrasion resistance. Mature brown coir fibers contain more lignin and less cellulose than fibers such as Flax and cotton and so are stronger but less flexible. White coir fibers are harvested from the coconuts before they are ripe. These fibers are white or light brown in color and are smoother and finer, but also weaker. The coir fiber is relatively water-proof and is one of the few natural fibers resistant to damage by salt water. Fresh water is used to process brown coir, while sea water and fresh water are both used in the production of white coir. CoirGreen is a company that focuses strongly on our customers’ needs. We pride ourselves on excellence in the manufacturing and retailing of fine quality Coir related products. Our company has a commitment to continuous improvement so our products consistently meet the needs of our customers and comply with internationally y accepted standards. We make every effort to provide the highest quality products to our partners and customers. CoirGreen include handling and testing raw materials, record keeping, standards for cleanliness and safety, production and process controls, labeling practices, and warehousing and distribution as well as dealing with ethical business practices. Coir Green (CG) products have proved useful in many different aspects of erosion control and horticulture/agriculture. Soil erosion is usually caused by wind, water, or ice; by down-slope creep of soil and other material under the force of gravity; or by living organisms, such as burrowing animals, as well as by us humans. It is a serious problem globally, resulting in catastrophic damage to water, landscape, and wildlife. Repairing the effects of soil erosion can be difficult, time consuming, and expensive. Global soil erosion destroys over 15 million acres of land each year and studies suggest that increased rainfall will lead to greater rates of erosion. Erosion control involves the prevention or control of wind or water erosion in agriculture, land development, and construction. Most commonly, some form of physical barrier, such as vegetation or rock, is built to absorb some of the energy from the wind or water that is causing the erosion. Effective erosion controls are important techniques in the prevention of water pollution and soil loss. Steep slopes, low soil fertility, unstable soils, compacted tills, flowing silts, and other adverse conditions are typical of many landslides globally. 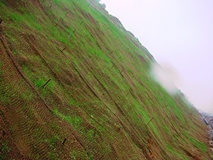 Restoration following landslides is a significant challenge; however, CG’s coir products, such as Geotextiles (CGgeo) can be used to complement soil bioengineering or bio technical techniques. Slope stabilization and soil bioengineering can be used to provide a self-sustaining vegetation cover on many landslides and unstable slopes. For example, the use of grass and legume seeding for erosion control, or more complex slope stabilization with live cuttings and other plants, or even reinforced ground, such as concrete blocks. Today’s stabilization experts can produce results that are both effective and aesthetically pleasing. Water erosion is caused by two different actions, both of which can be controlled by CG products. Firstly, erosion is caused by the movement of water across the riverbed (Hydraulic action). Secondly, the sediment being transported in the river wears away the riverbed (Abrasion) and the fragments themselves are ground down, becoming smaller and more rounded (Attrition). Greater understanding of the role of vegetation would enable us to better utilize vegetation on stream and river banks to provide well integrated river system management. New and innovative methods for recovery of stream-bank vegetation on persistently bare gravel bars include bioengineering techniques using CG natural coir products, CGgeo, CGblankets and CGbio, which are used to stabilize sediments in the bank. This “bioengineering” or “soil bioengineering” is a collection of technologies mainly derived from European research and application over the last 200 years. Within the Horticulture industry, coir fibre and its extracts are regarded as good substitutes for many other commonly used products. CG’s natural coir maintains excellent air porosity even after saturation. With a 96% pore space, it allows the water to drain easily, preventing water logging; yet at the same time, it allows it to hold a maximum amount of water (78%), which remains available at low tensions, to the plant’s requirement. 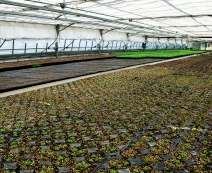 Coir products are therefore an excellent substitute for peat, enhancing the growing medium of many plants. Additionally, it can also be used to make pots in which to grow the plants.